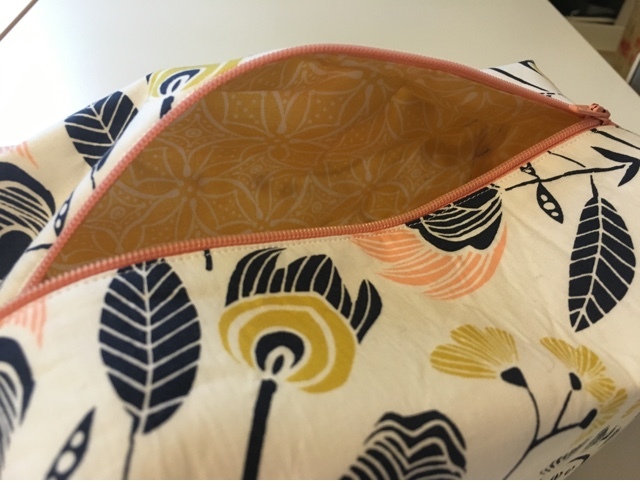 We decided to conduct a zippered pouch swap within the Boston Modern Quilt Guild, which we conducted at our November meeting. 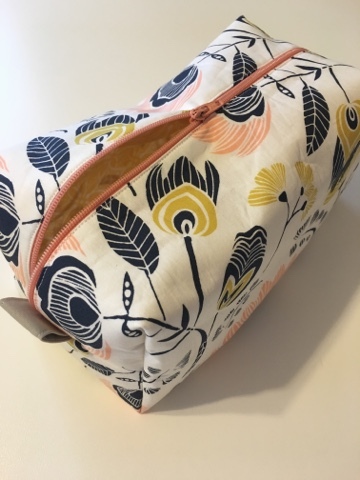 I love making zippered pouches and thought this would be a fun, easy swap that didn't require a ton of time for our members. While I've made a ton of zippered pouches, I never made a boxed pouch. I decided this was the perfect opportunity to make one. I used the Boxy Bag pattern by Kelby Sews. This really came together quick and easily. The most difficult part was when I went ahead and trimmed my plastic zipper and then unzipped the pouch to iron it. Well, I forgot to tack the end of the now-trimmed zipper and the zipper came right off the teeth and into my hand. It took me a good 15 minutes to get it back on. Once I did, it was smooth sailing from there. You can bet I won't be doing that one again. This fabric is an Art Gallery fabric that I got in a fat quarter bundle a year or two ago with the coordinating yellow print. The zipper is from Zip It. I used three layers of 101 Pellon interfacing for this. Two pieces on the outer fabric and one on the liner. The pouch is stiff enough to stand on its own but flexible enough to allow the new owner to manipulate it as she wishes.